Technical analysis provides powerful tools that can be used to explain price movements in markets. Technical indicators are a significant part of technical analysis. Technical analysis may initially seem complicated but learning to use these tools provide you with trading opportunities that can make the sacrifice of studying them more than worth it. Technical indicators and oscillators are statistical calculations—sometimes extremely complex—that provide a statistical analysis of price in a market. These indicators use price and sometimes volume to measure the strength of trends, relative strength, volatility and other characteristics. You can use these tools to alert yourself to trading opportunities and predict highly probable market outcomes. All of these indicators are provided by the trading platform at any good Forex broker. Moving average convergence/divergence, or MACD, uses a 26-day exponential moving average (EMA) subtracting from the 12-day EMA. A nine-day EMA of this value is then plotted over top of the MACD. This signal line generates buy and sell signals when it crosses the MACD line. It can also alert you to divergences between price and momentum that tell you about potential changes in the strength of the market. The MACD is a lagging indicator, because it takes a while for the moving averages upon which it is based to reflect recent changes. This makes the MACD less useful for assets that are not trending. Relative Strength Index, or RSI, measures the magnitude and velocity of price movements in order to chart the current price in the context of historical price. RSI values of over 70 indicate strong positive momentum, while RSI values of 30 or less indicate strong negative momentum. RSI values over 70 are generally termed an “overbought” signal, while RSI values over 30 are considered an “oversold” signal. Divergences can also be seen in the RSI and this can presage a reversal of the current trend. When the market price increases over a given time range and the RSI decreases or is the same over a given time range, or the market price decreases while the RSI increases or is the same, this is an RSI divergence and signals a trend reversal is imminent. What this means in the case of bullish divergence is that momentum is increasing at a time when price is decreasing. A bearish divergence means that momentum is decreasing while price is increasing. This imbalance between price and momentum suggests that price is about to change in order to match the momentum. Confirmation from price moves or other indicators are needed before proceeding with an actual trade. Bollinger Bands capture volatility that is present in a market. It is composed of moving average with upper and lower bands representing the standard deviation plotted above and below. One strategy that can be used with Bollinger Bands is to wait for the bands to get close together. Since Bollinger Bands measure the volatility in a market, this happens in markets during low volatility. When volatility is low, it means that volatility is bound to increase at some point. This means that a breakout is probable. As opposed to using Bollinger Bands to anticipate a breakout, they can also be used to identify a breakout. Price that exceeds either the upper and lower bound of the Bollinger Bands is a significant price move. Thus, Bollinger Bands can be used as a signal that a breakout is underway. Bollinger Bands are not desirable for trending markets, however. Simple moving averages and exponential moving averages plot the average price over a given number of periods. Exponential moving averages smooth out the curve created by the moving average in an attempt to filter out noise and irrelevant data. Moving averages can be used to identify uptrends and downtrends. For example, if the 50-day simple moving average crosses above the 200-day simple moving average, the asset price is in an uptrend. Conversely, if the 50-day simple moving average crosses below the 200-day simple moving average, the price is in a downtrend. Some use one simple moving average and define a trend by whether the price itself crosses the moving average line. Technical indicators give you insight into market price in relation to historical price, how powerful a current trend is in relation to recent historical price, the volatility in the market and much more. This data can be utilized to find trading opportunities that a fundamental trader would be completely oblivious to. 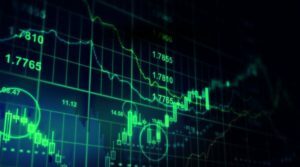 When these technical indicators are combined with chart patterns and fundamental analysis, they provide a powerful toolset for trading success.